Jetpack Joyride developer Halfbrick has today announced its expansion into worldwide mobile publishing, which will see the company expanding its portfolio of games with third-party titles that it says deserve recognition. The first game in this initiative is Enfeel’s Birzzle Fever, a bird popping game that sees players earning points by tapping on groups of like-colored birds to remove them from the screen. 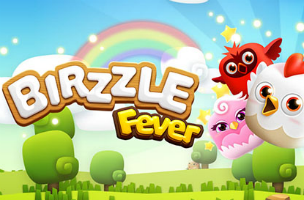 In Birzzle Fever, players have a minute to earn as many points as possible. The faster players make matches, the more points they’ll earn, and the more “super birds” are added to the screen. These power-up birds can clear whole sections of the board at once, boosting players’ scores even higher. The game offers over 200 missions to complete, and will be available for free on iOS devices on June 19. The next game under Halfbrick Publishing will be Yes Chef, another puzzle game, which is currently in soft launch in Australia and New Zealand.